Jason Sacran has a BFA in painting from Tennessee Tech University, and credits towards an MFA from the Academy of Art University in San Francisco. Jason and his family live in Fort Smith, Arkansas, where he was the curator for the Fort Smith Art Center for almost three years. In 2010 Jason became a full-time artist/painter, and part-time instructor for the University of Arkansas Fort Smith. Jason is also the Arkansas state ambassador for the Portrait Society of America. 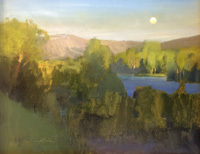 He has had several exhibitions and been awarded many times for his works and achievements including a first place award in the Portrait Society of Americas 2011 Members Competition, Best of Show in the 2010 Wisconsin Plein Air Painter Association Annual Competition and Best of Show in the 2010 Winthrop Rockefeller Institution Invitational. Although an avid plein air painter, Jason is best known for his figurative and portrait work. -Academy of Art University, San Francisco, CA – credits towards M.F.A.